At last I’ve finished “The story of Robert Strachan b. about 1808 and (1) Margaret Haggerty b. 1808 and (2) Susan Cran or Kirkwood born about 1819”. It can be found under the STRACHAN tab above. I’ve added scans of relevant documents and a few old maps. If you read it and think you’re connected to anyone mentioned, do add a comment and say hello. It’s taking time to work my way through all the research I’ve already done, and when I work on something I always find a reason to do a bit more research. So getting everything onto this blog and web site will no doubt take care of the next few years – but what’s retirement for if it’s not for going things you love doing! Today has been a genealogy day, thanks to rain outside and not having any prior commitments. I’ve been writing the “John Strachan and Margaret Haggerty and Susan Cran” story and am nearly there, but it has involved checking up on an awful lot of people. As John Strachan had 15 children, most of whom also had large families, there’s a lot to put together. Doing the research today certainly has had its up and down. Oh, the joy of discovering two ancestors were married at the same time in the same place and are on the same page you download from ScotlandsPeople! Except the registrar gave them both the same parents when that wasn’t the case, but you do learn that not everthing on a certificate is always accurate. Then how annoying when you find a 1911 census entry, only available from ScotlandsPeople, spread over 2 pages and so have to pay for 2 downloads. I love ScotlandsPeople but it’s very easy to get carried away and spend far too much money buying credits, which is why I try to get as much as I can from Ancestry. And isn’t it joyous when you track someone from childhood, through marriage, through all the census and to a death entry without a hiccup. And how frustrating when someone just disappears and searching for them under every variation you can think of producing absolutely nothing. I’m wary of using trees on Ancestry as so many are poorly researched, but looking at someone else’s research can be a very good starting point, as long as you check their research and don’t just accept it. It then becomes frustrating when you look for a particular ancestor and find no-one else has got them on a tree. Poor, unloved ancestors! The overwhelming thing about my Strachan ancestors, however, is how pretty much every male prior to the 1900s – and there are an awful lot of them – became a coal miner. What would Ayrshire’s coal industry have done without them? This day 98 years ago, my grandfather’s Gordon Highlander regiment landed at Boulogne. Plus a childhood death, a coal miner’s death and a migration to Canada. Birth of David Findlay, son of David Findlay and Susanna Strachan and grandson of my gggg uncle and aunt Peter Strachan and Mary Munroe. David died in childhood, before the 1851 census, as did his mother. I’m not sure of the dates when either of them died, but by 1851 father David had remarried and another son named David Findlay had been born. Death of Robert Strachan – there are lots of Robert Strachans on my tree and this one was born in about 1834, son of Andrew Strachan and Elizabeth Howat, which makes him my 2nd cousin 3 times removed. His mother died when he was about 10 years old and his father married Margaret Todd. Robert became a coal miner, in 1855 married Ann Bain at Dreghorn, and had 9 children. Some time before 1871 the family moved to Saltcoats, where they lived in Auchenharvie Row, and it was there that Robert died. He was 49 years old and died of asthmatic bronchitis and general debility, which was no doubt a result of working down the coal pits. My grandfather James Fraser, who had enlisted with the Gordon Highlanders in September 1914, landed in Boulogne. He was in France until November 1916 when he was wounded at Beaumont Hamel during the battle of the Somme. Margaret Milne, from Hatton, Aberdeenshire, arrived in Quebec, destined for Vancouver where she had a job to go to as a domestic servant. There’s interesting detail in landing papers: she was 5ft 4ins with fair complexion, blue eyes and fair hair. The daughter of Alexander Milne and Elizabeth Thomson, she was the granddaughter of my ggg aunt Janet aka Jessie Fraser. According to a descendent of hers with a tree on Ancestry, Margaret married Alexander George Birnie at Vancouver in March 1922, and died in Vancouver in 1952. Lots of my ancestors lived and worked at Shewalton Colliery from before 1841, so were part of the community described in a report written for the Children’s Employment Commission. I’ve typed up the part of the report about Shewalton and included it under the Articles tab. It seems that Shewalton was a pleasant mining community to live and work in compared to most, which explains why so many of my ancestors stayed there for quite some time. They did, however, move pretty much en masse to Kilwinning parish in the 1850s. The extract gives a clue as to why: new pits were being opened at Perceton (written as Pearston in the report) offering just as good living and working conditions. My research has led me to believe that most of my Strachan coal mining ancestors were “desirable employees” – good at their jobs and useful members of a coal mining community. Hence they were often poached when mine owners were opening new pits. And it seems that if you employed one Strachan, a lot more of them would be along soon! Quite a few Strachan men were promoted to pit manager, so it seems they must have had a good reputation within the coal mining industry. A popular day for being born in Scotland. Plus several interesting comments to be made about some of today’s featured ancestors, and another sad mining accident death. Birth of Elizabeth Milne at Longside, Aberdeenshire, daughter of John Milne and Jean Smith and an ancestor of my great grandfather’s second wife. She married her cousin William Aitken on the same day their son William was baptised. Her husband was a farm servant and then crofter, and they eventually settled in Cruden parish where she died age 79. Her husband William Aitken died when he was 90. Birth of Elizabeth Ballantine at Kilmarnock, Ayrshire daughter of Thomas Ballantine and Susanna Strachan and granddaughter of my gggg uncle Robert Strachan and his wife Jean Kelly. Elizabeth made it to 1841 but I suspect she died in around 1847 as her parents named a daughter born in 1849 Elizabeth. Re-using names given to children who didn’t survive may seem macabre today, but it can be handy for family historians. Birth of James Ewan McWilliam at Peterhead, Aberdeenshire, son of my half gggg uncle David McWilliam and his wife Elizabeth Ewan. James is in the 1841 and 1851 census with his parents in Peterhead, but then disappears from the records, so he may have died after 1851 but before 1855. Birth of Adam Aitken Haggerty at Dundonald, Ayrshire son of my ggg uncle Hugh Haggerty and his wife Janet Muir. Adam Haggerty age 30 is on an 1870 passenger list going to USA, and he is in the US 1880 census at Judsonville, Costa Contra, California with his brother Hugh and his mother Janet (Jennet in the census) who was keeping house for them. He then disappears from the records that I’ve been able to search. My great grandfather William Fraser finally got round to marrying his second wife, Helen Ann Morgan, a year after she’d given birth to their first child together. They were married at their home at Hatton Lodge, in the village of Hatton in Cruden, Aberdeenshire. Birth of my mother’s cousin in Aberdeen, who I knew and who sadly passed away some years ago at too young an age. Family story has it that he was conceived in Leeds when his parents, William Dow and Barbara Fraser, were visiting my grandparents here. A sad mining accident death to report today. Baptism of Jean Fraser at Arbroath, Angus. She was the daughter of Donald Frazer and Margaret Sharp, who later lived in Cruden, Aberdeenshire and had a son William Fraser who I strongly suspect was the father of my illegitimate ggg grandfather William Fraser. That would make Jean Fraser William’s aunt. Difficult to trace Janet due to lack of records, but she might be the one who was married in Cruden in 1798 to Thomas Buchan. Birth of David McWilliam at Longside son of William McWilliam and Janet Sangster, and half brother of my ggg grandfather William Fraser. David worked as a sawyer, married Elizabeth Ewan, had at least 12 children and lived in Peterhead. A sawyer was someone who cut timber into planks using a saw pit. David died in 1886 at the age of 70. 1890 April 16, Broomlands No. 8, Dreghorn, Bourtreehill Coal Co, Peter Strachan miner age 43; category: falls of roof and sides; cause: fall of roof at working face. 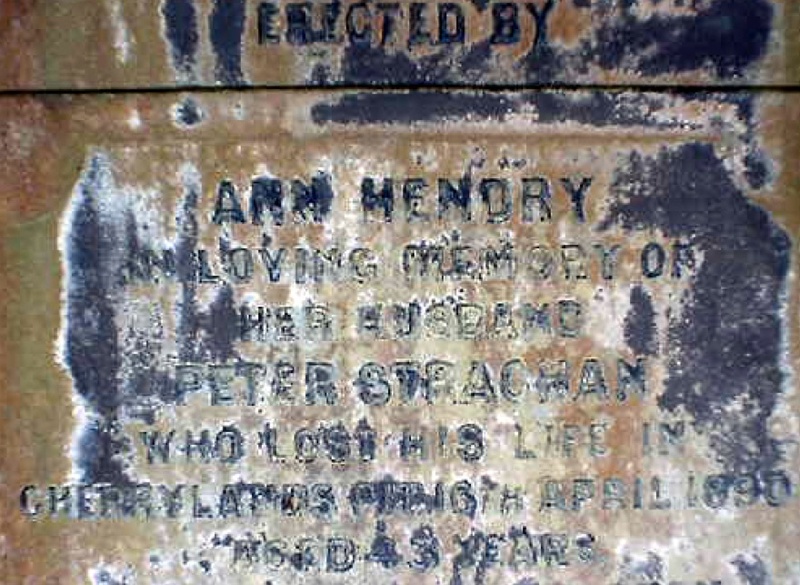 Peter left a wife of 40 years old and 9 children aged from 22 down to 7, and there is a MI for him in Dreghorn churchyard. A Strachan descendant of the younger generation was born on Tyneside. Only one event to report for today. Birth of John Strachan, my great uncle, at Crookedholm, son of Joseph Strachan and Jeannie Haddow. No surprise that he was a coal miner. On 21 December 1890, at 15E Block, Railway Buildings, Hurlford (known to locals as “The Blocks”), he married Lucy Alice Robertson. In 1901 they were at Cowan’s Row, Crookedholm, which is also where my grandparents Henry and Helen Strachan lived: Henry was John’s next youngest brother. Then at some time between 1906 and 1910 John, Lucy and their children moved to Tollcross, Glasgow, which is around the same time as my grandfather Henry and his family also moved to Tollcross, so it sounds as if the two families were close. In 1911 John, Alice, their 7 surviving children and a boarder were at Fullerton, near Tollcross, and John was working as a roadmaker at a coal mine. John died in 1941 at the age of 71.